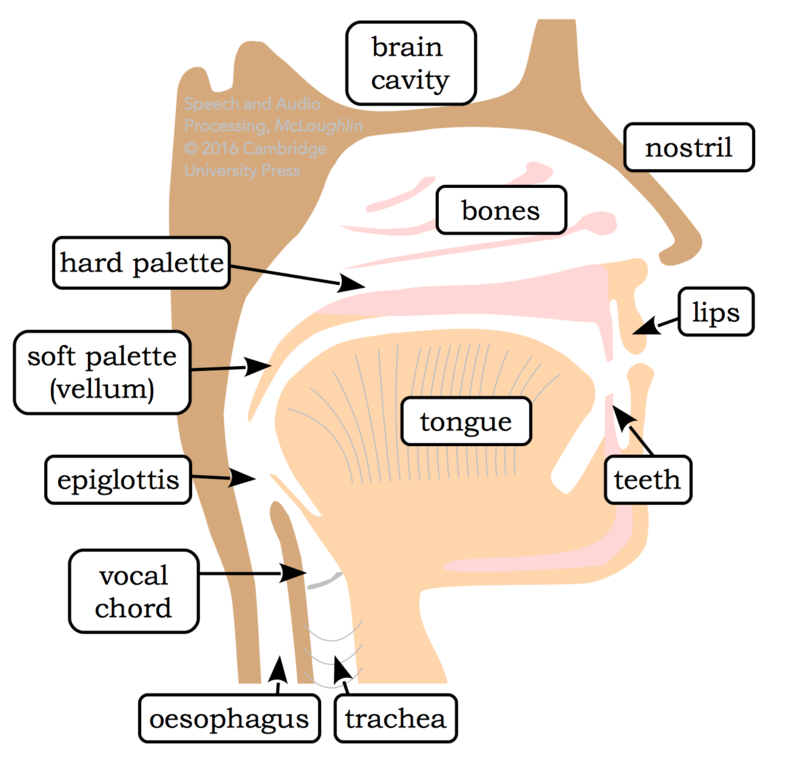 Most speech -- at least for the near future -- is generated by the human voice production system, comprising lungs, diaphragm, glottis, vocal tract, tongue, teeth, lips, nasal cavity and so on. Plus the brain. The brain is important at the motor level in providing the fine and fast control of the vocal actuators to form the phonemes of speech. At a higher level, the brain encodes meaning into those strings of phonemes. Similarly, most speech -- at least for the near future -- is produced for the understanding of human ears, and the comprehension of the human brain, and thus we will look much closer at the human hearing system in Chapter 4. If readers wonder why I used the phrase "at least for the near future" twice in the paragraphs above, this is because of the ongoing growth in text-to-speech systems, where computers generate speech for humans to hear, and in ASR (automatic speech recognition) systems by which computers listen to our speech. With the aid of these two rapdidly improving technologies, we can envision a future where most speech communications is computer-human rather than human-human. These are the three main types of everyday speech. Note: turn down the volume before you play the sample below! Let's take things further by doing a bit of simple plotting and visualisation of this recording. Assume you have downloaded the sample to your MATLAB directory (Ctrl-click or Alt-click the sample player to download it). Remember you need to use the US spelling of the word colour throughout the MATLAB command set - it does not take long to get used to this but can be confusing for new users. The command "colorbar off" turns off the default stripe showing how the colourscheme of the spectrogram maps to energy or power. In this case becuase the recording amplitudes are relative (and possiby not even linear) it is meaningless and hence better off being removed. There are many types of colour map possible in MATLAB and you can even define your own, but jet is one of the common choices for spectrograms, and 'gray' (again note the US spelling) is the one to use for greyscale plots that will be reproduced in black and white.